Refrigerant lines are usually made of copper. An undersized air conditioner is better than an oversized one. One ton of air conditioning equals 12,000 BTU/hr. That can cool 700 – 1,000 sq. ft. in Michigan and 450 – 700 sq. ft. in Florida. Thermostats should be located near the center of the house, away from direct sunlight, fireplace, light bulbs, etc. In a split system, the condenser fan is located outdoors in the condenser unit and evaporator fan is located indoors (may also be the furnace fan). Heat pumps have many of the same components as air conditioners. In our Air Conditioning & Heat Pumps Course, complex mechanical systems are broken down into simple components. Starting with basic principles of operation and building on an understanding, considerable detail is provided on how these systems fail. Upon completion, students can inspect air conditioning and heat pump systems as a professional home inspector. 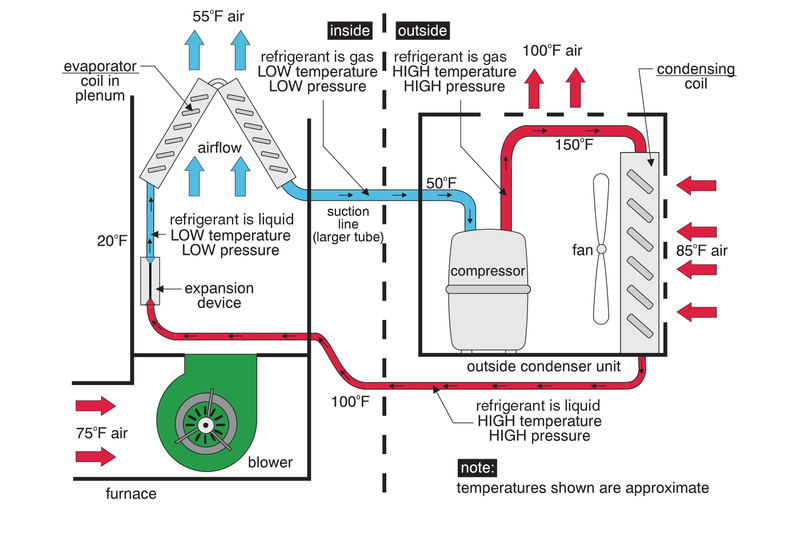 Air conditioning – schematic of system — This illustration shows the refrigerant loop and how a house gets cooled. It is from our Air Conditioning & Heat Pumps Course. All of our 10 Courses contain easy-to-understand illustrations that help you understand the subject.